Unlike the first roads built for commerce and horses, the Long Island Motor Parkway was conceived from a sporting contest; the colorful, exciting and often dangerous Vanderbilt Cup Races. At the turn of the 20th century the superiority of European automotive craftsmanship cast a long shadow over America’s fledgling car industry. 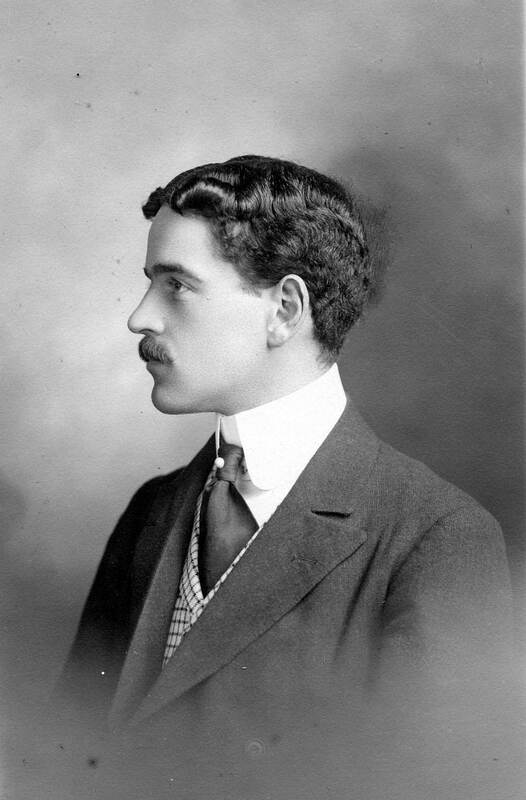 To encourage American automobile manufacturers to challenge European quality, 26-year old William K. Vanderbilt Jr., heir to a railroad fortune and a pioneer race car driver, sponsored America’s first international road race modeled after those in Europe. The first William K. Vanderbilt Jr. Cup Race was held in 1904 over 30 miles of public roads in central Long Island. By 1906, fans from all over the country swarmed to Long Island to witness the battle of automobiles from the United States, France, Germany and Italy. Some of the reckless among the 250,000 spectators surged onto the narrow dirt roads to view their favorite drivers. 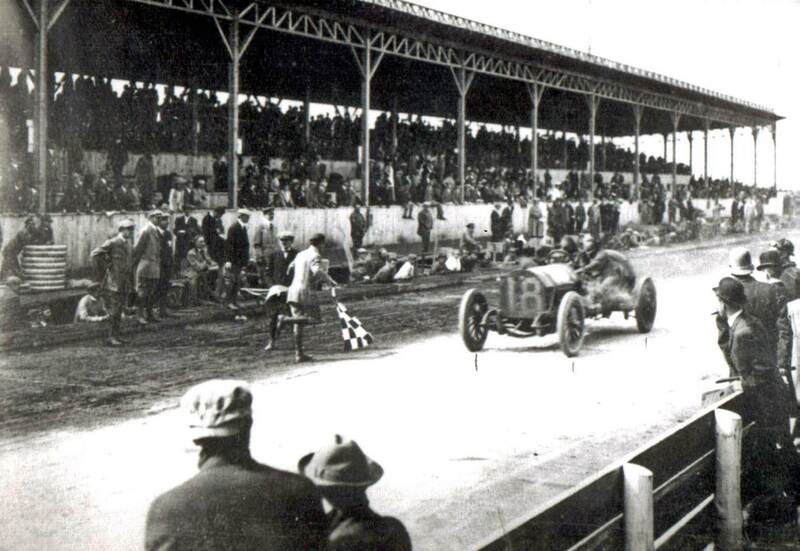 The luck of the crowd ran out during the 1906 race when a spectator was fatally struck by a race car. The death of a spectator nearly brought the classic to a premature demise. The marvel was that only one spectator had been killed in the three races held up to that time. Demonstrating vision again, Vanderbilt chartered the goal of a private highway. His dream was for a safe, smooth, police-free road without speed limits and a place to conduct his beloved international race without spectators running onto the course. Vanderbilt and his associates were careful to position this new and modern Appian Highway as a modern convenience to all automobile enthusiasts and not primarily as a speedway for race cars. They extolled the virtues of economic development and the efficiency of quickly retreating from the city to the calm and healthful benefits the fresh country air that Long Island had to offer. A frustrating series of set backs in obtaining rights of way to privately owned property resulted in a steady series of missed project milestones. The Vanderbilt Cup Race Commission was eventually forced to cancel the 1907 race and construction of the Motor Parkway was delayed until 1908. Throughout 1907 and the first half of 1908, Pardington, the Parkway’s general manager, worked hard to successfully obtain the right of way from Queens to Lake Ronkonkoma. 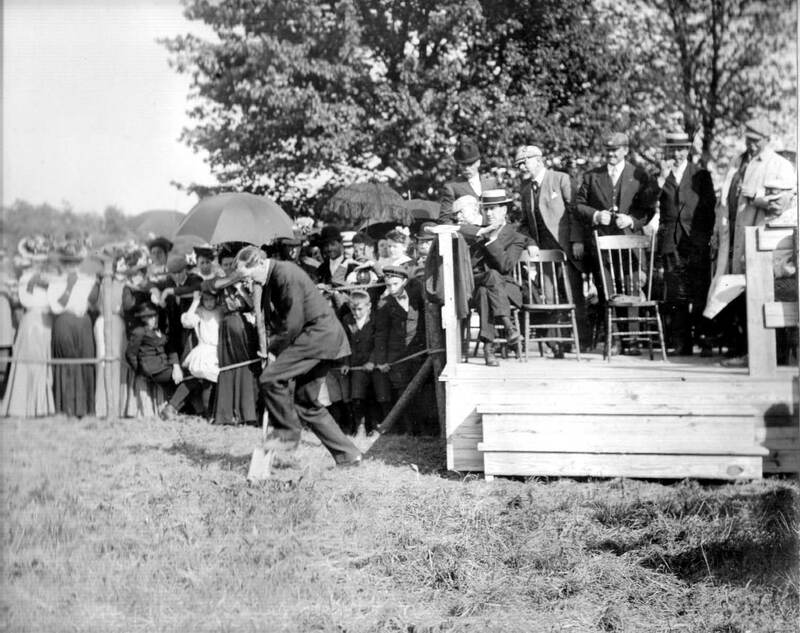 On June 6, 1908, the Parkway staged an official ground-breaking ceremony to commemorate the beginning of construction in Central Park, now Bethpage. With several hundred people in attendance, the original plan was for William K.Vanderbilt Jr. to make the keynote speech. But the sudden and grave illness of his stepfather Oliver Hazard Perry Belmont kept him away. Pardington, filling in, read from remarks Vanderbilt had written to mark the occasion. 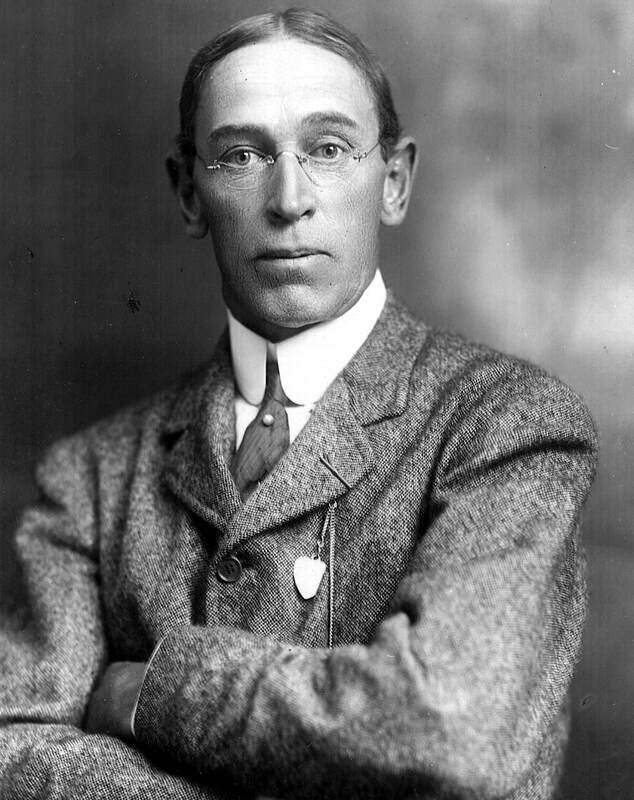 His comments praised the impact and potential of the automobile and reflected on the unforeseen obstacles that impeded the Parkways progress. Construction of the Parkway began between Westbury and Bethpage with a little more than nine miles of the planned 50-mile road completed in 1908. 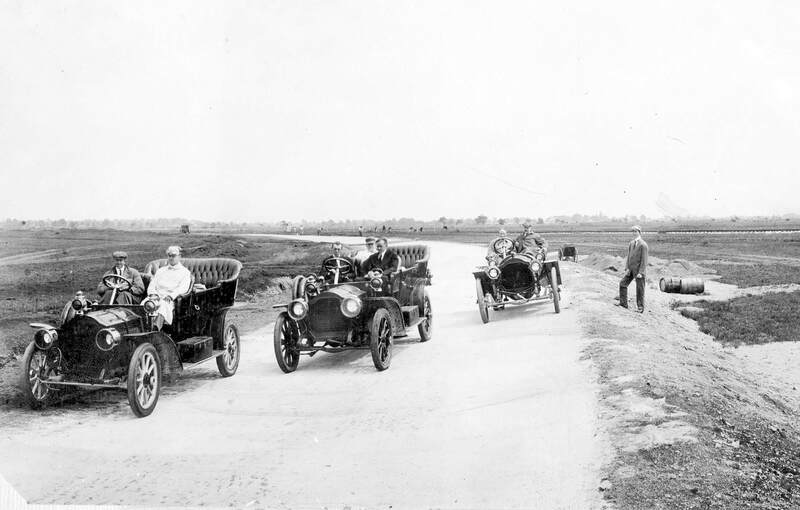 On September 10, 1908, plans were announced to christen the Parkway with an event called “Motor Parkway Sweepstakes”, which was held a month later. 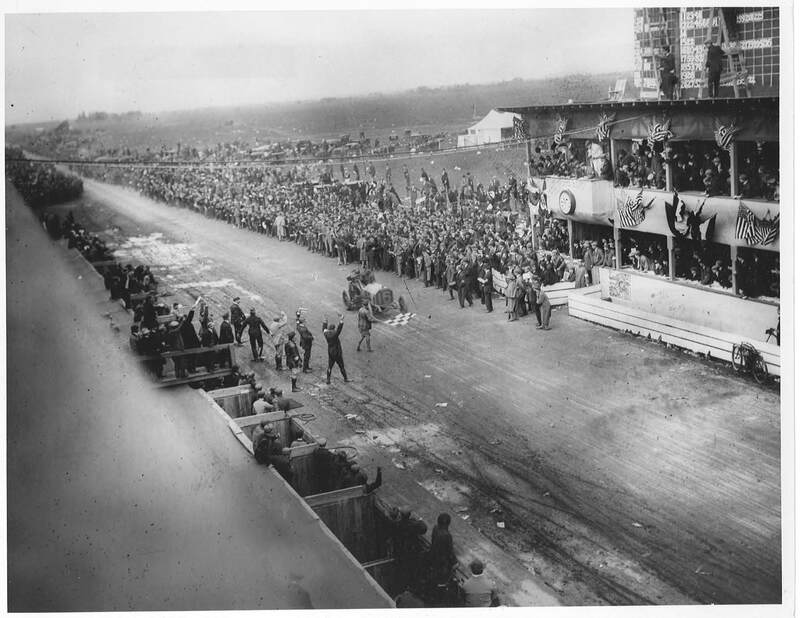 The purpose of the contest was to create an opportunity to test the new Parkway and the course, timing systems, and crowd control for the 1908 Vanderbilt Cup Race to be held on October 24th. The circuit for the sweepstakes and the Vanderbilt Cup Race included the finished portion of the Parkway and 14.45 miles of public roads. 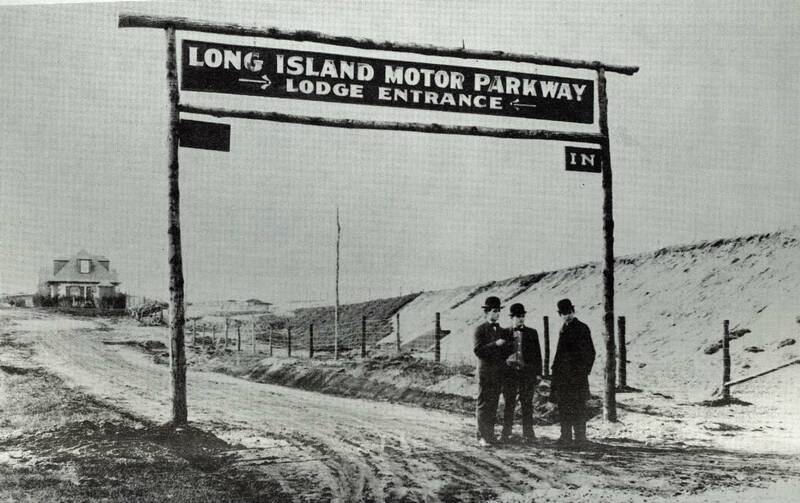 The Long Island Motor Parkway officially opened on October 10, 1908 in conjunction with the five sweepstakes races. Cars entered the course through the three toll lodges that had been constructed that year. These were the Meadow Brook Lodge (Merrick Avenue, Westbury), the Massapequa Lodge (Massapequa-Hicksville Road, Plainedge), and the Bethpage Lodge (Round Swamp Road, Old Bethpage). In 1909 and 1910, the race was held on a shorter course than any previous Vanderbilt Cup Race with the Motor Parkway making up only 5.51 miles of the total 12.64-mile distance. Organizers believed the shorter circuit would decrease the intervals of time between the appearances of cars and provide more exciting entertainment for spectators. Driver Harry Grant and his mechanician (driving mechanic) Frank Lee won both races in an American-built ALCO. 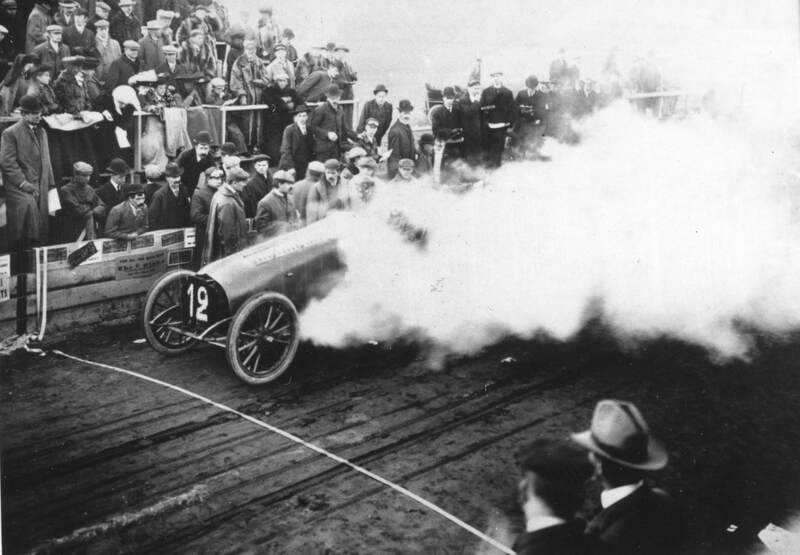 During the 1910 race, two driving mechanicians were killed and several spectators were injured. Newspapers and trade journals harshly criticized the race organizers for the fatalities and injuries citing crowd control as non-existent. At this point, it became clear to everyone that after six years of controversy that accompanied each race, the sport had outgrown the venue. 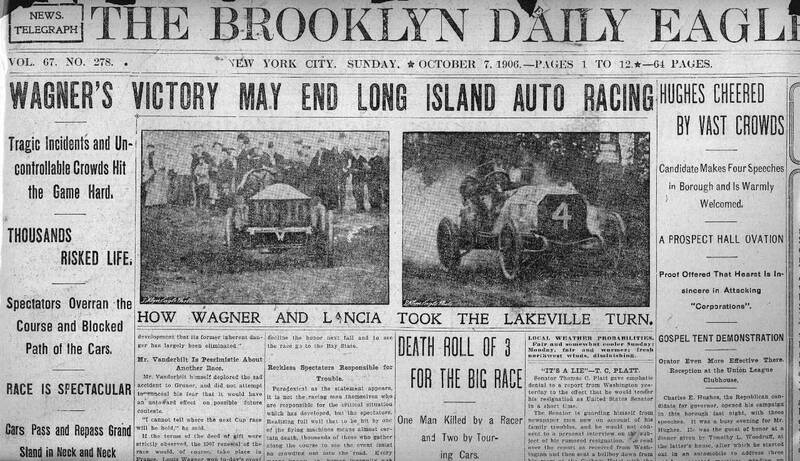 The two deaths from the 1910 contest effectively put an end to road racing on Long Island. 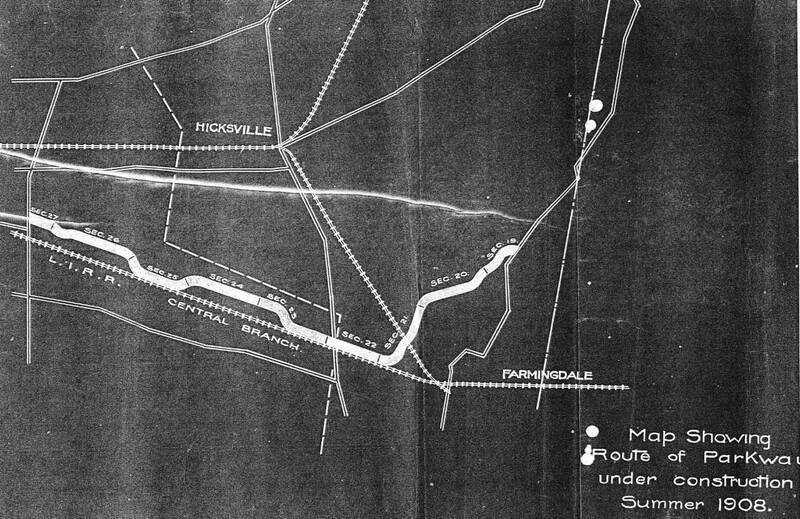 In 1909, the Parkway was extended westward from Merrick Avenue in Westbury to Jericho Turnpike in Mineola and eastward from Bethpage to Dix Hills. Where the previously constructed roadway was 22 feet wide, the new extensions had a width of only 16 feet. By June 1912, approximately 40 miles of the Parkway was opened from Rocky Hill Road, (Springfield Boulevard) in Queens to Lake Ronkonkoma. Initially it was planned to have inns for the travelers and automobile service facilities constructed throughout the length of the Parkway. Due to financial considerations, these features were eliminated. Another casualty was the shortening of the projected length of the Parkway. The eastern terminus would be on the western shore of Lake Ronkonkoma and never reach Riverhead. 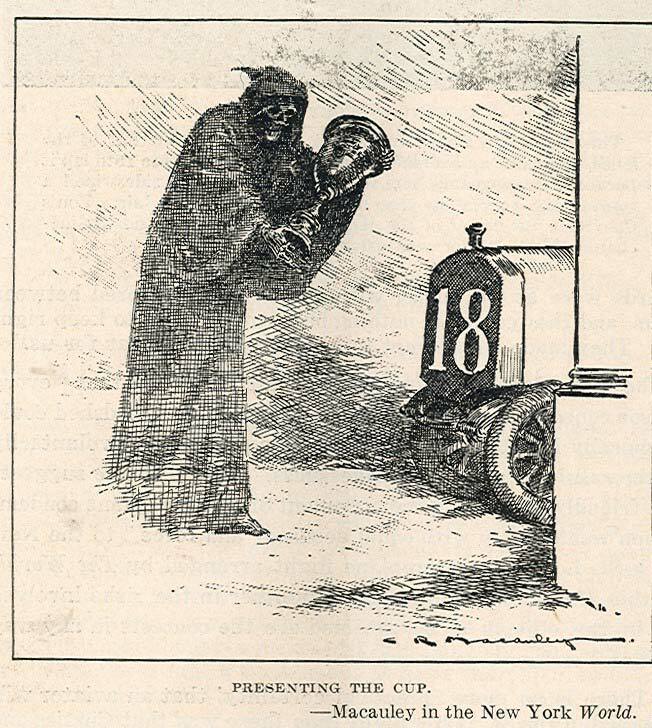 Since the Parkway was a toll road, gatekeepers were hired to collect the fees. The three lodges built in 1908 all had living accommodations for the toll collectors. 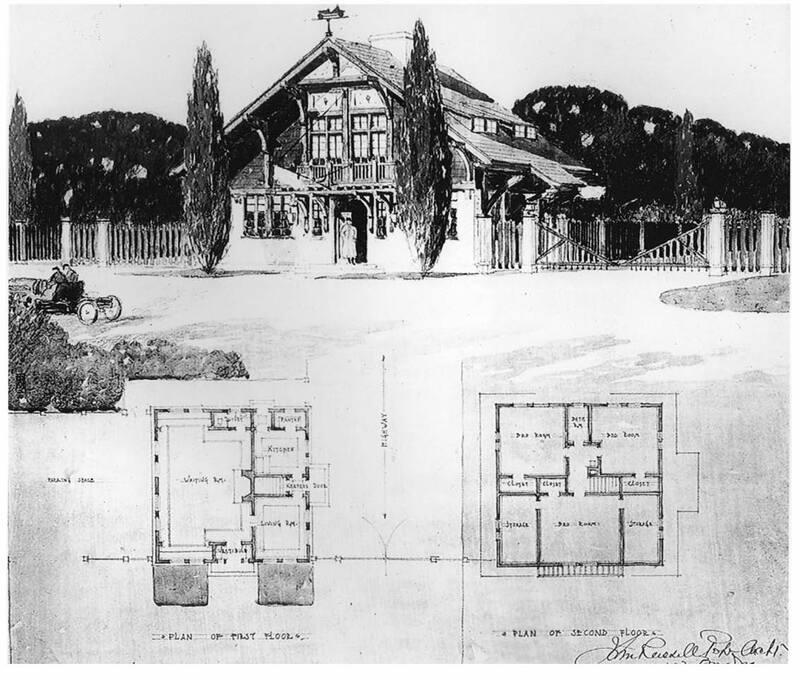 By 1911, three additional lodges were constructed. All designed by John Russell Pope, they were the Great Neck Lodge at Lake Success, the Roslyn Lodge at East Williston and the Garden City Lodge in the village of the same name. Two stories high, the lodges were constructed of stucco covered brick with steeply pitched shingled roofs. The interior of each lodge contained a small office, a pleasant kitchen and a large living room with a fireplace and stairs leading to two bedrooms above. Over the next several years, additional entrances were built at six more locations, often with confusing names that did not actually match their actual locations. In Queens, examples are the Nassau Boulevard Lodge (Horace Harding Boulevard) and the Rocky Hill Road Lodge (Springfield Boulevard). Three additional lodges were built in Nassau County; the Jericho Turnpike Lodge (Mineola), and the aforementioned Great Neck and Roslyn Lodges. In Suffolk County, confusion was created with the Huntington Lodge in Melville, and the Brentwood Lodge in Commack. Only the Ronkonkoma Lodge was properly labeled. 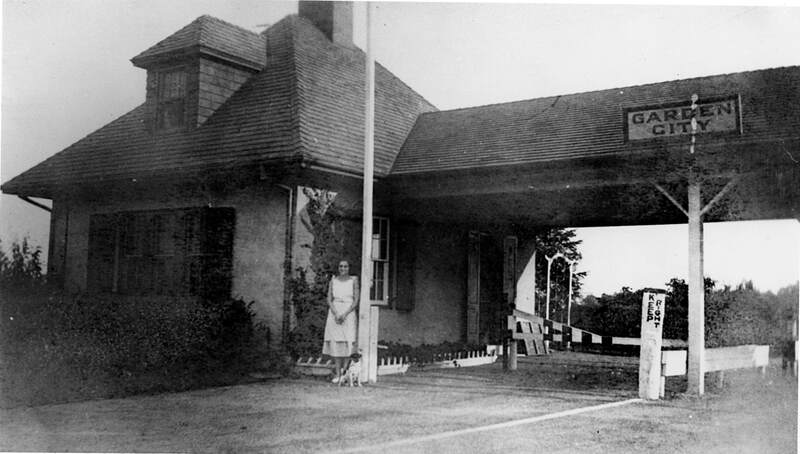 Many Long Island maps also noted a toll lodge at Deer Park Avenue, but no building was ever constructed at this location nor was this entrance ever manned. It was merely an entrance and an exit for the Motor Parkway. The price of a round trip was a rough measure of the Motor Parkway’s popularity. When it opened in 1908, the toll was $2.00 – roughly $45.00 today. In 1912, the toll was reduced to $1.50 and five years later reduced to $1.00. The toll fee held steady until 1933 when a dramatic drop in business due to the opening of the free Northern State Parkway occurred. At that time, the toll was reduced to $.40. As previously noted, major roads and rail lines were bypassed with bridges. 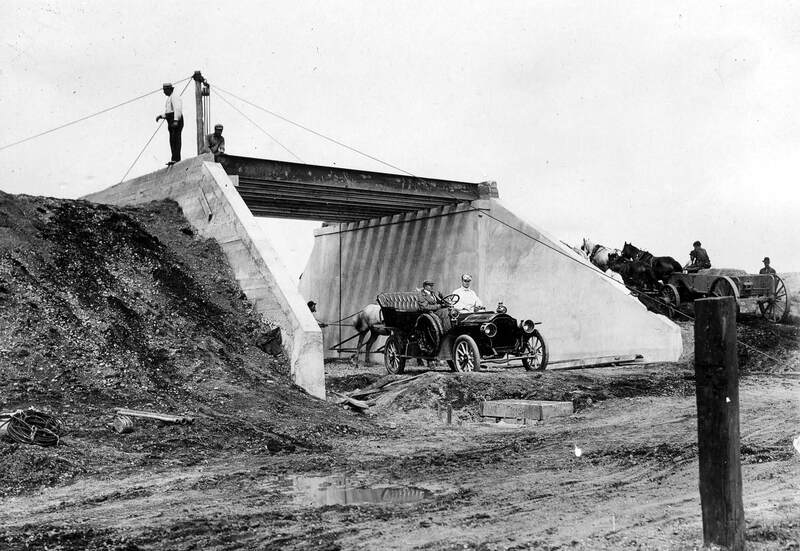 Eighteen bridges were built in 1908 alone, along the nine miles of roadway. For the most part, the bridges have clearances of 12 to 14 feet. This allowed even wagons piled high with hay to pass underneath easily. Overall, 65 bridges were built by the Motor Parkway. For many years, many of them remained in place as reminders of a different time. Those not demolished previously disappeared during the 1950s and 1960s during the population explosion and road widening projects on Long Island at that time. Demolition crews were amazed at the durability of bridges built with 50-year old technology. When the route to Lake Ronkonkoma was completed in 1911, Parkway officials decided to build a high society inn on the lake. Vanderbilt commissioned John Russell Pope to design a smaller version of the Petit Trianon, a small building on the grounds at Versailles near Paris, France. Pope borrowed many of the features of the French original including the general rectangular shape, the symmetrical façade with tall windows and a restrained use of exterior decoration. Small one-story pavilions flanked the structure providing seating and lounge areas. A large dining room suitable for weddings, balls, and special events occupied the first floor. Accommodations for spending a night or a weekend were available in the 30 bedrooms on the second floor. 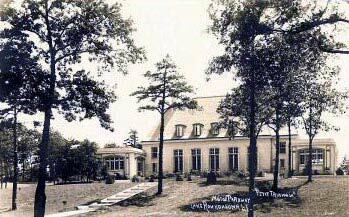 The Petit Trianon Inn was in business for 15 years with many parties held for Long Island’s elite motoring set. The inn later became a club and restaurant under various ownerships. On January 11, 1958, the structure was destroyed by fire. After five hours of battling the blaze, the landmark building had been totally destroyed. In the 1920s, the Motor Parkway benefited as the automobile became more commonplace in the lives of ordinary Americans. To serve the ever growing number of motorists, the Parkway was once again extended an additional 2.1 miles to the west. The new western terminus was now at Nassau Boulevard (Horace Harding Boulevard) in Fresh Meadows, Queens. 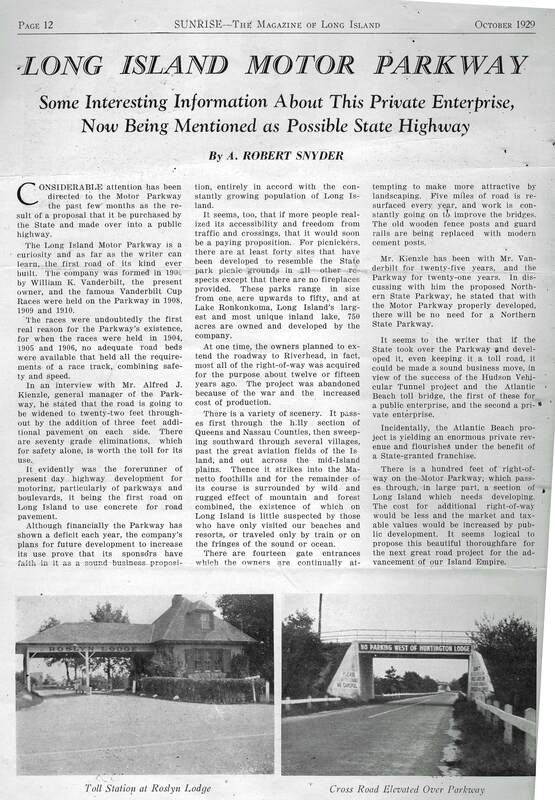 The total length of the Parkway was now approximately 47.2 miles.The last construction commissioned by the Parkway was a spur built in 1929 at Commack in Suffolk County. It was 2.1 miles long connecting Jericho Turnpike with the Motor Parkway. Today, the spur is known as Harned Road. Over the course of its 30-year history, the Parkway became a conduit for the development of Long Island and heralded the transformation of the Island from a rural area to a sprawling suburbia. At the peak of its popularity from 1924 to 1930, more than 150,000 cars traveled on the Motor Parkway. Even when business was booming, however, the Motor Parkway was a money losing proposition. In an effort to keep it open, Vanderbilt personally made numerous loans to keep it afloat. Vanderbilt and his associates never made a profit on their estimated $5 million investment. In 1929, a group of Nassau County millionaires tried to convince the state to purchase the Motor Parkway rather than build the Northern State Parkway through their properties. 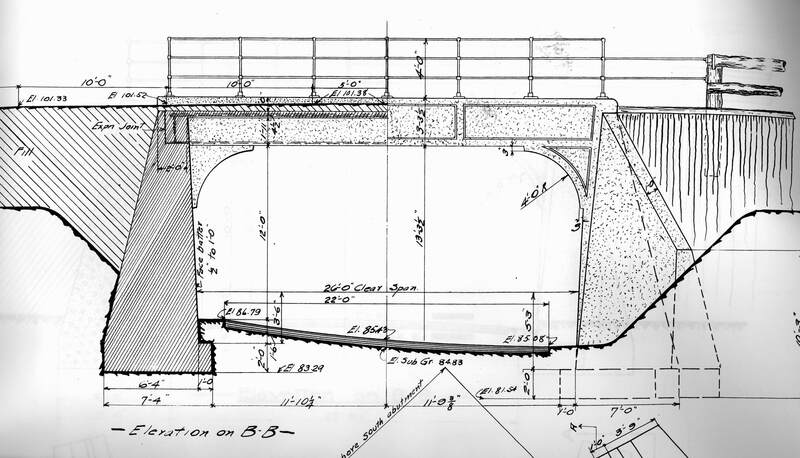 Noting its narrow 22 feet width and curves, Robert Moses, then head of the Long Island Park Commission, described the Long Island Motor Parkway as a white elephant that will “be given to Nassau and Suffolk Counties for nothing some day.” The crushing impact of the depression coupled with the ever expanding free New York State Parkway system effectively sealed the fate of the narrow winding Motor Parkway. On June 16, 1937, Moses’ prediction became a reality when Vanderbilt offered the Parkway to the public. It officially closed on Easter Sunday, April 17, 1938. Shortly thereafter, the right of way was turned over to Queens, Nassau and Suffolk Counties in return for the cancellation of $80,000 real estate back taxes. Remnants of the Long Island Motor Parkway still exist to this day in different forms. The Queens portion was originally turned into a public bicycle path and today most of it is still in existence as a ribbon-park connecting two larger parks. Nassau County incorporated small sections into their road system and other portions were turned over to utility companies for power lines. Some pieces were sold off to developers. Of the seventeen original miles in Suffolk County, the easterly 13 miles were incorporated into their road system and is now known as County Road 67.
you mention above that the parkway was extended westward in 1909 from Merrick Ave. to Jericho Tpke. in Mineola. I am pretty sure I lived beside part of this extension. It is 1 block west of Glencove Rd. off of Westbury Ave. northbound beside the hightension poles right of way. There is a roadway noticible on the top of a small hill that runs paralell with the high tension poles heading towards Jericho Tpke ? Also, I have noticed what seems to be an old overpass. It fits the description and construction of the overpasses built for the parkway. It’s located in the woods on the northbound side of the Meadowbrook Pky. just south of Merrick Ave. and Stewart Ave. Intersection. Can This be related?? Remnants of the Motor Parkway can still be found off Westbury Avenue. The overpass near Meadowbrook Parkway was part of the LIRR Central Branch. Here is a link to to a discussion of the overpass. Another link to information and photos of the LIRR Central Branch Extension.